Re: players maintaining the field... about 5 years ago I attended a Brooklyn Cyclones game (short season A, Mets), there were MASSIVE rains, and the whole team was out there with squeegees to get things going. The tradition isn't dead yet. That's minor league ball. The fact that this kind of thing happened in what people call "major league" ball in the 19th century is the central reason that it isn't actually major league baseball. Michael Clevinger is currently ranked as the #15 starter in the Starting Pitcher Rankings, and he is Cleveland's 4th best pitcher. Is this historically unique, to have a #4 starter who is that impressive? The Cubs of just a few years ago were similar, and I also think of Kevin Millwood around 1997 and of course the Orioles staffs of the early 1970s. The 1998 Yankees? Anybody else? I'd have to recreate the rankings all the way back. I don't know. Not only Millwood, but also Denny Neagle was at one time (a) fourth on the Braves, and (b) probably in the top 20 in baseball. The 1954 Indians, as I have noted several times, had a staff ERA of 2.78 in a year in which the league leader had an ERA of 2.64. Art Houtteman (15-7, 3.35 ERA) was their fourth starter, and Bob Feller (13-3, 3.09) was their fifth starter. I just wanted to let you know that yesterday at the Charlottesville, VA friends of the public library book sale I bought a copy of your 1981 Abstract. I was thrilled! I've been going to a lot of used book sales and in the back of my mind I always hope for some of your old original Abstracts to show up and this is probably the best I'll ever do. I can't wait to read it. (You must have a fan in Charlottesville because there were about 8 or 9 of your books there.) Thanks for all the writing over the years. Thank you. My mother-in-law, back in the 1970s, bought a Warren Spahn Hartland statue for 75 cents. I don't know what it is worth now. Quite a bit more than 75 cents. 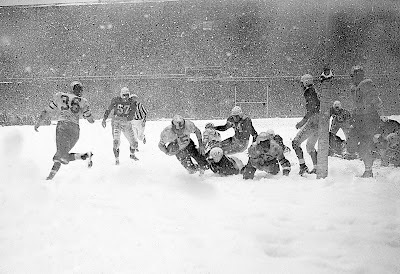 About players maintaining the field: The 1948 NFL championship game was played in a blizzard at Shibe Park in Philadelphia. Before the game, the players had to help roll the tarp off the field, something that apparently proved quite a challenge given the amount of snow on the field. When I interviewed some of those players 40+ years later, it was one of their clearest memories of that day. I've enjoyed your articles over the years about the Kansas City A's. As you pointed out, the A's had some good young players come up to Kansas City who did not ultimately succeed at the major league level. If I remember correctly, the A's management was impatient with its young talent and didn't allow them to develop before giving up on them, trading them, etc. By the time the A's were in Oakland, the team had a lot of great young players who formed the core of their championship teams of the 1970s. What changed that made the A's a whole lot better at managing young players in the late sixties than they had been in the mid sixties? They had the same owner for most of the decade. There is a new book about him; that's probably a better source on Finley than just my memory. I think he learned from his mistakes, albeit not easily. When Finley bought the A's, I think in the winter of 1959-1960, the farm system had a few guys but was very thin. Finley tried to rush the process by trading for veterans, expecting that they would do for him what they had done in other places. It didn't work. He churned through several General Managers, bringing in guys who had had the job before--including the infamous Frank Lane, who followed his dramatic success in Chicago with dramatic failures in several other towns. Eventually he found the right GM, Hank Peters, who was able to convince him that you just have to develop your own players; you can bring in other players to help, but if you're not producing, then you're working with used material. In '63 '64 '65 he spent a lot of money and signed a tremendous number of young players, who came together starting in '68. Well, really, in '66. Hey Bill...is a batter who leads off an inning with a walk really more likely to score than a batter who leads off with a single? (I think I know the answer). Exactly the same, I think. Bill, all of a sudden today there seems to be this idea about shortening games to seven innings. Wouldn't that create the same issues you talked about as the idea of an 8 batter line up? It would be a pretty serious problem for me. We don't need less baseball; we need less standing around and wasting time. Saw a discussion on ESPN about the ‘69 Mets. One guy was convinced that Gil Hodges was the primary reason the Mets improved dramatically, though he undercut the argument by say that ‘68 hadn’t been a significant improvement over ‘67 because "they were still only 1 game out of last place." (Hodges started in ‘68). Koosman has 9 awful starts in ‘67 (rookie), and in ‘68 was very good. Seaver also significantly improved. They went from being outscored by 25%+ to closer to 10% on the season. It sure seems to represent significant change. In ‘69 the Mets runs allowed was less affected than most other NL teams. Looking at home/away splits doesn’t seem to explain that. Both Seaver and Koosman were very young, so my guess is their continued improvement masked the effect of the rules changes somewhat. It was the first year off the unbalanced schedule (2 divisions) as well. I have a hard time attributing it to Hodges. Koosman and Seaver appear to have been great picks that paid off. It is a common flaw of analysts to deny the reality of complex interactions which are not yet fully understood. With the South Atlantic League planning to move the mound back two feet later this season, what are the likely effects we can anticipate? I'm expecting a slight decrease in pitcher's control, hence another walk or two per game. Slightly lower velocity should favor the hitter as well. Not sure if I really like this, (certainly don't see it speeding up the pace of play), but will be interesting to see how MLB evaluates the results and uses the data moving forward. Anything else you would focus on? It's too radical. I am expecting that it will be such a farce that they'll have to abandon it after two weeks and admit that they made a mistake. The big issue is that your breaking pitch is going to break at the wrong time. Every breaking pitch is GOING to be in the dirt, I think. You train your whole life to make your slider break at 45 feet; you can't just move it to 47. I think it just won't work. In the fall the University of Kansas is offering a new course about angry white men. Are you signing up? I'm a guest exhibit. They're going to ask me about CEO salaries. I was trying to figure out the difference between Yaz's speed and Kaline's, and I wondered if you knew their speed scores, or have any strong subjective thoughts about who was faster. Doesn't much matter, I suppose, but my memory is that Kaline was a good baserunner, quick, smart, hustling, and Yaz was good too but not known for his foot-speed. Yaz has a worse SB% (59%/ 68%) but that's only a small part of speed scores, as I recall. I think Kaline was faster, but let me go check speed scores. I have Kaline as a "9" when he first came up, an "8" for several years after that, and with a career speed score of 6.1. Yaz, I have with a Speed Score of "7" when he first came up and for several years at the start of his career, with a career figure of 4.3. This is potentially misleading because he was around for a LONG time after his 67-70 peak, but anyway. ...yeah, Kaline was pretty clearly faster. i seem to recall in an old publication of yours that examined intentional walks and your conclusion that they were statistically not beneficial. I am of that view and it was reinforced last night when Montoyo called for a walk to fill the bases so Mayza could pitch to a lefty. He then walked in a run. Are you still of that view (if you ever were)? thanks. I've moderated my view a little bit. I used to argue that there was literally no situation in which an intentional walk was a beneficial strategy. I don't run simulations anymore and I'm not as tuned in to some of the fine points, but just intuitively I am a little more inclined to think that there are some situations. . . But also, years ago, managers would use the intentional walk in situations where it isn't really done anymore. So I've changed, and they've changed, and I haven't really studied it recently enough to know how we line up now. Thanks. I have never been irascible, because I don't know how. Are there books and articles that a lay person could understand the economics of baseball? Caan the MLB sustain itself given its structure. For example online gaming might be more popular, engaging and challenging. What would motivate a fan base to go to a park or watch a game? I'm not really seeing whatever the problem is that you're worrying about there. I watched the 10 minute long silent YouTube film of the 1920 Indians game on a small (phone) screen; I have to be cognizant of the possibility that my eyes deceived to me. After the appearance of the title card mentioning that the players had to move quickly to get the tarp over the infield once the rain came, I do believe that I did see a mix of uniformed players with team employees covering the field. Assuming my vision matched reality, would you care to guess what might have been the most recent era during which MLB players had field care responsibilities? I can see how the players probably thought it in their own best interest to help care for the field (in addition to wanting to avoid being released); it’s just such a break from the practices of my lifetime that it makes me curious how long ago this practice ended. No idea. I know that players had to help maintain the field, in the low minors, into the 1950s. © 2011 Be Jolly, Inc. All Rights Reserved.